You can't listen to music, yet. You can search and add music to your library. 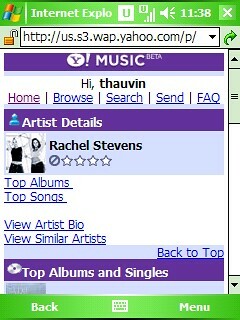 The added songs will be fetched the next time you login to your Yahoo! Music Unlimited account from a PC. You can also send links to Yahoo! Music Mobile pages via SMS. I don't know if the service is limited to Cingular right now, but I wasn't able to login unless accessing via MEdia Net. It's beta, and it shows. A lot of consistent UI glitches on various phones. More importantly, I seriously doubt the whole catalog is searchable yet. I wasn't able to find a lot of the songs/albums which are available via the Yahoo! Music Jukebox. Overall, it shows potential. Definitely a service to keep an eye on. This article was published on November 30, 2006.